Winning ugly may go against the philosophy of Portadown head coach Richard Hedley but Saturday’s final whistle proved a welcome sound at Chambers Park. The 15-5 victory against CIYMS arrived with Chris Cousens’ penalty success central to the closing scoreline. The Qualifying League result failed to provide high entertainment in difficult playing conditions but Hedley was happy to bank the final tally after back-to-back defeats by Clogher Valley. “Sometimes you just need to get the win,” said Hedley. “It was not much of a game given the miserable conditions. “Basically, we kicked our penalties but CIYMS failed to match that return, with one try apiece. 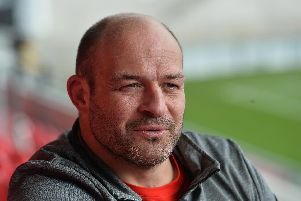 “We have a Conference League match now this weekend and will use that to reshuffle the players to try and find some more effective combinations. Portadown firsts v Ballynahinch seconds (league, away, meet 12.15): M.Neilly, G.Reid, R.Reid, M.Henderson, D.Alexander, A.Winter, G.Hall, D.O’Kane, G.McCoy, D.Tully, R.Purvis, A.Morton, N.Irwin, J.McClure, C.Megarrity, J.Orr, C.Cousens. Seconds v Dungannon thirds (league, home): M.Davison, D.Thompson, G.Reid, J.Graham, AN.Other, J.Burns, RJ.Greenlee, D.Hardy, J.Hampton, O.Montels, C.Chambers, R.Ciack, C.Woods, R.Quinn, S.Buckley, H.Anderson, M.Neilly. Thirds v Belfast Harlequins thirds (league, away): G.Caldwell, D.Cornett, S.May, C.Dunne, P.Keightley, S.Lyness, J.Elliott, K.Boyce, G.McCullough, B.Gribben, M.Beale, D.Harpur, AN.Other, R.Duffy, AN.Other. Fourths v Ards thirds (league, home): A.Gilpin, W.Craig, S.Close, A.McClue, B.Milligan, J.Haslem, B.Newell, K.McQuaid, AN.Other, J.Matthews, C.McCann, S.Lappin, R.May, C.Creaney, H.Clarke, A.Matchett, G.Elliott, J.Williamson.